The implementation of phase 2 was very similar to phase 1. The same data collection tools were used (observation guides, teacher journal, feedback forms, class discussions). Just as in phase 1, my students were assigned a presentation project with bounded choice. 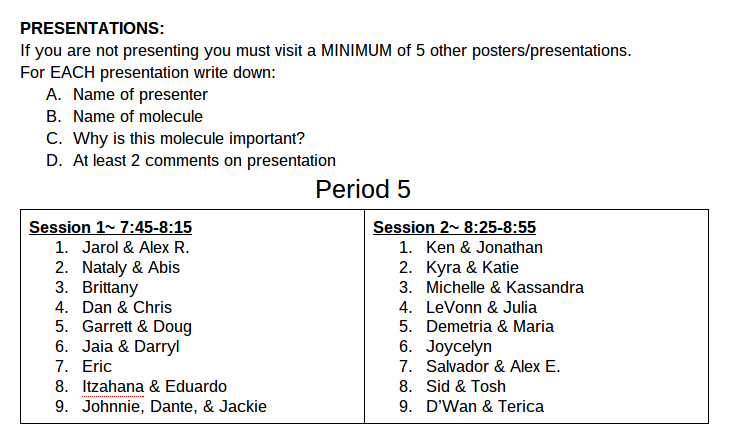 This unit’s project focused on organic chemistry and biochemistry and was entitled the “Organic Molecule Project.” The assignment sheet for the project can be found here. In this project, my students had to choose an organic molecule (any molecule containing both carbon and hydrogen) on which to become an expert. To become an expert they spent time doing web research on the molecule and were instructed to argue why their molecule is important to research. This was meant to approximate what a scientist would do when writing a grant proposal. In order to fund their research scientists must be able to articulate the importance of their proposed research. I asked my students to do something similar. They were to play the role of a scientist presenting their findings on their molecule at a scientific conference. The goal was for my students to create a strong, research based argument defending the importance of their chosen molecule. They worked in teams of 2-3 students and were given 2 weeks to conduct web research on their molecules and create a poster or powerpoint presentation illustrating their findings. A rubric for the project was created using the same method as the Thermochemistry Project and can be found here. To create this rubric I listed what the highest and lowest levels of quality would look like, then for the middle levels filled in what aspects proficient (meets expectations) and emerging (almost meets expectations) would contain. 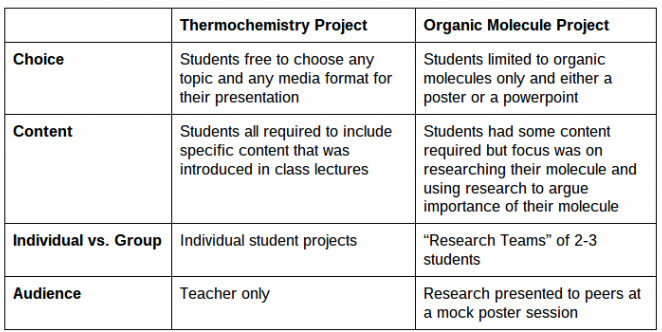 The project had some similarities and some differences compared to the Thermochemistry Project, documented in the chart below. As you can see, the choice of topic and presentation medium was more limited than before, however students were more free to choose what content to include. Because I wanted to emphasize to my students that they were playing the role of the scientist in this project I introduced the project with a discussion of how scientists share their knowledge at conferences. 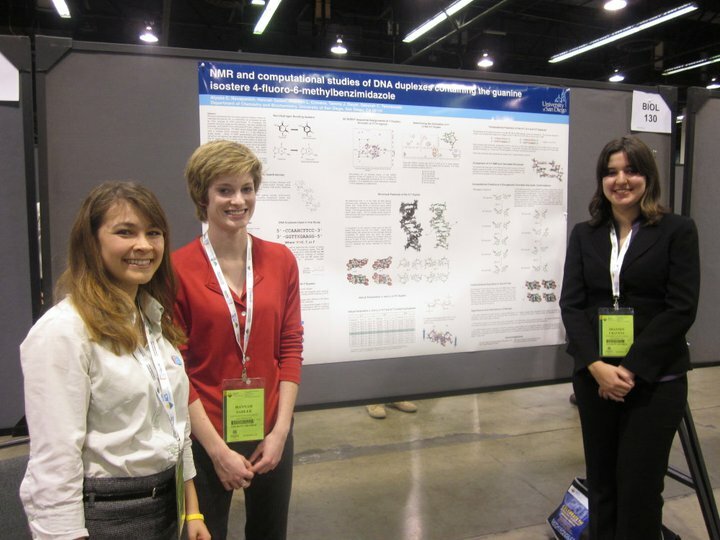 I showed them pictures of poster sessions at scientific conferences and shared a few personal photos of my research team and myself presenting posters at various conferences (below). I also brought in the poster in the picture below and put it on display for the duration of the project so my students would have an idea of what a professional poster would look like (visuals, text, organization, etc.). After this introduction one of my students commented, "I want my poster to look just like yours. I'm going to put the school logo on it and everything." I also explained the process of research funding to my students, discussing that funding often depends on arguing the usefulness and importance of the research and, as scientists, they would need to argue the importance and usefulness of their molecule. To support my students as they moved through completing the project, I spread the pieces over several class periods. This allowed me to check that each group had found an organic molecule and helped the students meet the content objectives of the project right away so they could focus on researching the molecule. To help my students find a molecule that interested them, I directed them to an online simulation called “House and Garden” which listed the molecules found in common household items. During this time engagement was nearly 100% as students went through the house finding molecules of interest. Many gravitated towards food items. Others chose molecules that they thought would be challenging. A few were interested in researching illicit substances such as alcohol and cigarettes. One student even asked, “Can I do meth? Like in Breaking Bad?” I allowed this provided the presentations focused on the harmful effects of the substances. On the second day there was some time for my students to begin researching their molecules. Their assignment was to turn in a bibliography with 3-5 resources by the next class period. Engagement was difficult to measure because of the nature of the lesson. Students worked through a series of assignments before starting their research so not all students had time to start their research. Those that did were highly engaged in seeking information on their molecules. It was very different from my observations during the Thermochemistry Project; in contrast to the Thermochemistry Project where my students were mostly looking for pictures, they were actually seeking information on their molecules. I wrote in my teacher journal, “There was content research going on rather than just visuals and drawings.” However the next day revealed that only 50% of students completed their bibliographies, possibly due to insufficient class time to complete the assignment. The unusually high level of engagement caused me to wonder if my students had no obligations (projects or exams) in other classes. I recalled how engagement had plummeted when my students had assignments in other classes during the Thermochemistry Project. Perhaps the opposite, having no other assignments, would increase engagement? 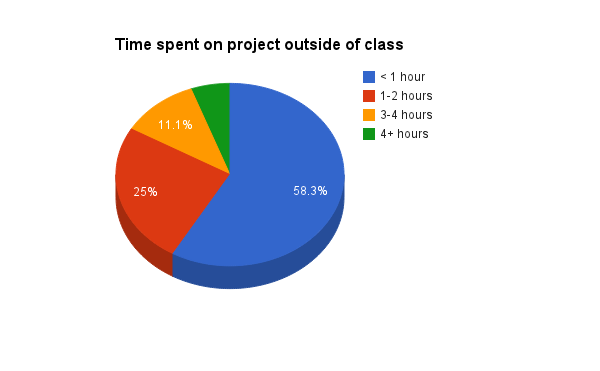 This prompted me to ask the classes, “Do you have projects or tests in other classes?” To my surprise they responded in the affirmative, with one student claiming he had “like 10” assignments for other classes. I knew I would need to dig further to uncover their motivations. After a week and a half, the student projects were due in class but it was not yet the poster session. I wanted the students to have a class period to solidify their presentations and make any changes before the big day based on peer feedback and their own experiences while practicing their presentations. Based on past experience, I also only expected about 75% of the groups to have their presentations ready so this extra day would be to their benefit. Much to my surprise only two teams out of 40 had nothing to show and only three other teams were frantically gluing text to their posters, giving an 87.5% completion rate for this project. Their posters were for the most part very high quality. Elements of professional posters were present in many including block paragraphs explaining their argument, chemical structures, and visuals representing their information. For this day, each team presented to one other team with the goals of 1) practicing their oral presentation and 2) convincing the other team that their molecule was important. On this day there was about 85% engagement. Those students who were not engaged felt did not present to other teams or edit their presentations and socialized among themselves instead. Those who were engaged listened respectfully to each other and made final touches and edits to their posters. By the end of the period all groups had very informative, completed posters, shown below. Half of the class presented in session 1 while the session 2 presenters visited the posters, then after 30 minutes they switched. Only two students were not prepared to present, giving the presentations a 95% completion rate, unprecedented in this class this year. The students were truly experts on their molecules and were fielding questions from their peers. Only two students were not fully engaged. The classroom really was transformed into a poster session. Between the discourse and the interest students showed in each others’ work it genuinely looked and felt like a group of scientists at a conference. During the organic molecule project I noticed a huge increase in engagement over the phase 1 project. To collect data on motivation and engagement I used a combination of observation notes in my teacher journal, an observation guide/seating chart were I marked off-task behavior, student feedback forms, student work, and class discussions. Off-task behavior was practically non-existent for the duration of the project. Almost every single student had a high quality, completed project to present in the poster session. More students came in to work at lunch than in the entire year previously. Clearly they were highly motivated and engaged with this particular project and I wanted to know why. In the days following the poster session I wanted to find out what had motivated my students to complete this project. I thought they would be less motivated and engaged with this project because it was less artistic and directly connected to their lives, yet the opposite turned out to be true. There were several methods I used to triangulate the causes of my students’ sudden burst of motivation: a post-project feedback form, class discussions, and student journal entries. The post project feedback form (right) was administered to the students the day after the poster session. It was structured very similarly to the form administered in phase 1, with a combination of agree/disagree, multiple choice, and open response questions. The results of agree/disagree questions from the Organic Molecule Project are compared with those of the Thermochemistry Project below. Interestingly enough, although a higher percentage of students stated that they found a topic of interest in the Thermochemistry Project, more students responded that they enjoyed the project, put in their best effort, and worked on the project at home for the Organic Molecule Project. 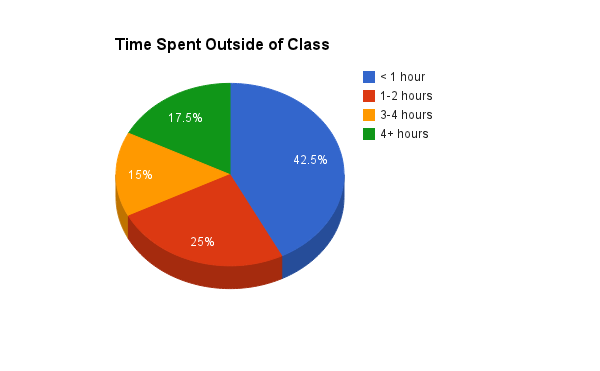 They also spent more time on outside of class on the Organic Molecule Project (see graphs below). My initial thoughts were that the Organic Molecule Project was more challenging and required more effort from the students, however, when I did a member check with my students (asking them directly if they thought this project was more challenging) to test this idea the consensus was that both projects were “about the same” from a difficulty perspective. I needed to dig deeper to uncover the motivation. I took the feedback form question asking what the best part of the project was and coded the student responses to determine what the possible motivating/engaging factors were. The results are shown below. Choice was still a top contender, however it was beat out by presenting and working on a team. From this data it appeared that the audience, presenting to peers, may have played a role in motivation. To confirm this theory I took the motivation discussion to my students. I asked them a series of questions and recorded the student responses. 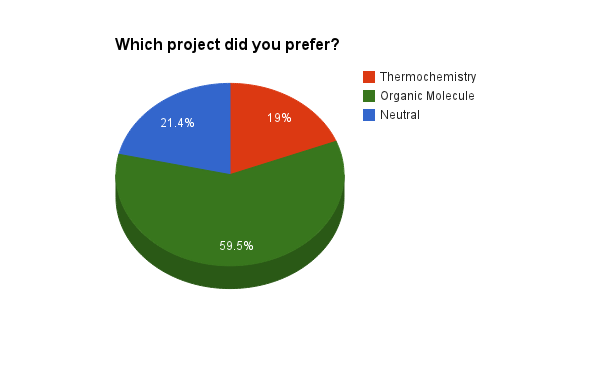 First I polled the classes, asking whether they preferred the Thermochemistry Project or the Organic Molecule Project, the results of which are summarized in the graph below. The majority preferred the Organic Molecule Project and I wanted to find out why. In their feedback forms I asked my students to compare the two projects. Many students felt like they learned more in the Organic Molecule Project, which I confirmed with class discussion. 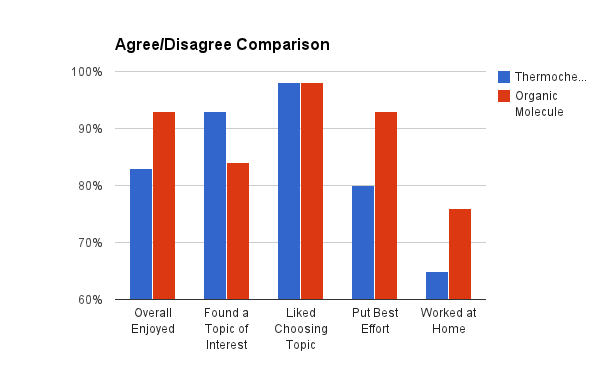 The overall theme from these student responses is that they liked learning new information. From these conversations it seemed like the end of the school year combined with the aspect of presenting their projects publicly were strong motivators. Based on my phase 1 findings I was not surprised that the looming deadline of the end of the school year was an extrinsic motivator. In hindsight it is also not surprising that the public demonstration of knowledge was a motivating factor for my students, however, I wanted to further explore my students’ perceptions of the presentations since they had also categorized presenting as one of the best parts of the project. After observing my students during the poster session and assessing my students’ motivations (one of which was presenting) I dug deeper into their perceptions of the experience. Immediately after the poster session I asked my students what they thought of the day while it was still fresh in their minds. They responded, “I liked it! It was like, interactive.” Another student responded that they enjoyed that they “got to go around and see everyone’s work.” Many also thought it was well structured. The social aspect of the poster session definitely seemed to be a winner with the students. To get a more representative voice from the class as a whole, I also asked them to journal about the experience. 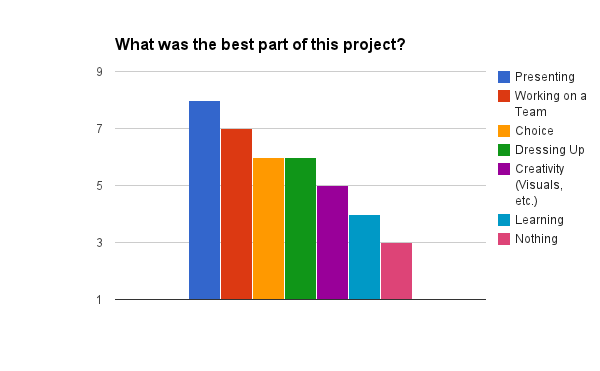 I gave them the prompt, “Describe what you liked/disliked about presenting your projects.” Once I collected and read their responses, T set about coding the responses and teasing out themes from the class as a whole. Out of 39 responses, 8 mentioned that they generally dislike presenting because of a fear of public speaking, however, half of those responses also mentioned that presenting to small groups as they did in the poster session was preferable. Four students responded that they disliked the repetitiveness of presenting their poster every time a new group came, however, five responded that they liked the repetitiveness because it gave them the opportunity to improve their oral presentation. Eighteen students responded that they enjoyed how interactive this form of presenting was. Sixteen responded that they enjoyed becoming the expert (learning about their molecule and teaching others) and an additional seven responded that they liked replicating the experience of presenting like a scientist, indicating that it was a good experience for the future. Overall, it appeared that interacting with peers and learning to teach others were the most positive aspects of the poster session which consequently lends itself to student perceptions of themselves as scientists. One of the most exciting results of this project was the increase in the percentage of students perceiving themselves as scientists. After phase 1, only 28% of my students perceived themselves as scientists. When asked if they perceived themselves as scientists after participating in the poster session 51% responded that they perceived themselves as scientists, a fairly dramatic increase. This outcome was as I had hoped, but I wondered about the reasons students were seeing themselves as scientists. I used data from my students’ journal entries and my own observations to extrapolate some of the reasons students were seeing themselves as scientists. Many students mentioned in their journals that they liked interacting with their peers during the poster session. They liked seeing the work of others and, based on my observations, enjoyed engaging in academic discourse with their peers. I noticed not only presenters imparting their knowledge but their peers engaging in questioning. Often these consisted of the presenter introducing an industrial use for a chemical that the audience was not familiar with, the audience inquiring about the unfamiliar term, and the presenter going into depth to explain the concept. This also plays into another point the students mentioned in their journals, that they enjoyed learning about their molecule and becoming the expert. It is possible that in the process of becoming the expert, imparting their expert knowledge, and engaging in discourse with their peers, the students began to see themselves as expert scientists. In addition to extrapolating reasons for the increase in students’ perceptions of themselves as scientists I also asked the students during class discussions why they did or did not perceive themselves as scientists. Students felt that they were scientists based on their participation in experiments, acquisition and sharing of knowledge, and use of academic language. Students who did not feel that they were scientists cited that the class lacked authenticity as well as things mentioned in phase 1 (educational level and amount of knowledge).